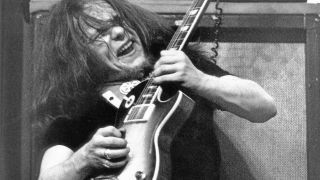 The late British guitarist Paul Kossoff had a style so distinctive that you could identify his playing after hearing just one note. This is mainly due to his use of an intense, fast and wide fretting-hand vibrato, which became something of a trademark. In his early days, he briefly studied classical guitar, but the lure of blues-rock soon came calling and he absorbed as much as he could from BB King, Freddie King, Albert King, Clapton and Hendrix - and he never looked back. His first ‘proper’ band was Black Cat Bones, who were then followed by The Wildflowers. After these came the two bands he is best known for: Free and Back Street Crawler. Free achieved a great deal in their five-year career, which included six studio albums and a live album. Two highlights were their performance at the Isle Of Wight Festival and, of course, the hit song with the guitar riff to die for - All Right Now. There were also many other great songs such as Fire And Water, The Stealer, Mr Big, I’m A Mover and Little Bit Of Love. There’s a lot to be learned from Kossoff. Here is a breakdown of the examples and ideas contained in my demo piece. The track begins with an open-string riff idea that works well as a device, particularly in a three-piece instrument format where they help fill things out. Aim to let the notes on beats 1, 3 and 4 of each bar ring into each other. The notes on beat 2 should be played in a staccato manner as indicated (with a little palm muting if desired). The Free track The Stealer was the obvious influence here. One of the things I love about Kossoff’s playing is his rhythm work and, in particular, some of the chord voicings he used. In this example you can see how there are two unison bass A notes at the bottom of each chord shape. These are fairly unusual and help fill out the sound. If you play the second one of these, combined with the two additional shapes that can be seen later in bar 11, you will have the classic All Right Now changes. I wouldn’t be surprised if this style of voicing came about due to his early classical guitar influences. In this example we see a few more typical chord voicings, such as the Fire And Water-style G5 - D(no5)/F# - D5/A. These particular shapes, again, are fairly unusual and work really well as substitutes for conventional G - D rock/blues changes. Try them! Open strings also abound in these shapes. Notice the voicings that contain both open Gs and open As. These are extremely ‘guitaristic’ and can be reapplied in many other situations. I should also mention the A5 chord in bar 6 - it’s without doubt a must-use rock chord. This section centres on some sparse phrasing ideas that hopefully illustrate that it’s the overall feel, width and speed of the vibrato, and the rhythmic phrasing (as opposed to the quantity of notes) that matters. The idea is to commit yourself to playing the notes and make them speak in an appropriate way. This isn’t as easy as you might think. If you jam over the supplied backing track, using both major and minor pentatonic scale ideas would be the norm. In my solo, elements of both are used, as well as a touch of the A blues scale in bar 15. For an appropriate vibrato on the bent notes you should always try and support whichever finger is bending, where possible. Make sure you listen closely to this aspect of Paul’s playing. One last point here is in regard to the ‘sympathetic ringing’ that occurs in bar 16. If you watch the video at this point, you can see how my hand moves and yet both the E and D notes can still be heard. This is due to the ringing on an open string and the D note that was on the B string now being picked up as a sympathetic vibration/ harmonic on the open D string! This is a cool idiosyncrasy. Play it with the D string unmuted and then muted, to see what I mean. This final five-bar section kicks off in bar 22 with some ‘three against four’ phrasing of a repeating three-note major pentatonic scale lick. The obvious influence for this comes from Paul’s solo in All Right Now. All that is happening here is that a repeating three-note lick is played in groups of four, and, by doing so, the notes become displaced on each repetition. This makes the idea sound far more interesting than had the same three notes been repeated in straight triplets, for instance. Aim to keep the underlying 16th-note grouping in mind and also try not to rush and all should be fine. In this case, you will need to repeat the three-note lick eight times before entering the closing series of string bends (bar 23, beat 3 until the end). After playing this lick as written, it would also be a good idea to try it beginning on all the remaining down- and off-beats. This varying placement will feel different and is well worth becoming familiar with.